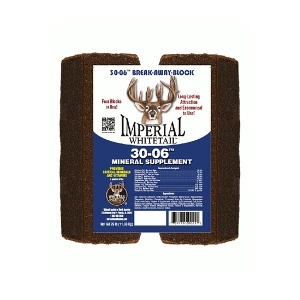 30-06 Mineral Block delivers essential macro and trace minerals along with vitamins A, D, and E needed for a healthy herd and for bucks to reach more of their genetic potential in antler growth. 30-06 Mineral Block is a true, professionally formulated, high-quality mineral and vitamin supplement – not a glorified salt lick. Our exclusive scent and flavor enhancer draws deer to 30-06 Mineral Block quickly and consistently. 30-06 Mineral Block can easily be broken into two, three or four separate blocks for use at multiple sites.